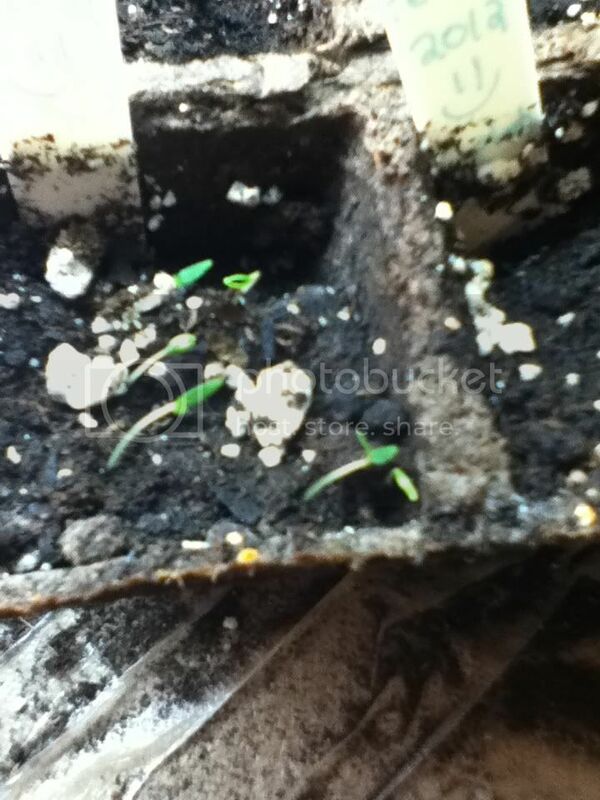 Tomatoville® Gardening Forums Index > What Else Do You Grow? > Miscellaneous Edibles > Tomatillos > Ground Cherries, anyone? Anyone else grow ground cherries? I'm trying them this year, a few years ago I had one plant and it had delicious pineapply fruits! Any tips? I just sowed seeds now, since you are supposed to sow them earlier than tomatoes. Also, are ground cherries related to tomatillos? I thought so, but wasn't sure. I can't wait for these little guys! I figure I'll keep three plants, and throw them in a pot. What size container is good for three plants? Or what size container is good for one plant? I'm trying them this year, too. Haven't gotten them started yet. Thought they would go in at the same time as the tomatoes and tomatillos. Thanks for the heads up! I'm going to be trying to garden in straw bales this year and was thinking two plants to a bale, as I've heard that they tend to sprawl. Hopefully, someone who has grown them will enlighten us! No problem! They grow pretty slowly when they are seedlings, so you need to start them early. You plant them out at the same time as tomatoes, though. What do you mean, garden in straw bales? Sounds interesting! I grew several different "strains" (?) of them last year for the first time and started them way early because of what others said about the slow growing, etc. They were easy, grew more quickly than I expected so had to be potted up twice (to 6" containers) before planting out in the ground in mid-May after there was no chance of frost in the 10-day forecast. No problems growing them- planted them on 18" square pattern as they really spread. They grow low and wide (30"?) and the fruits will fall off when ripe- and some before ripe. When you go to harvest the ripe ones, it's impossible not to knock off the ones not so ripe. They attracted chipmunks who loved them and hid in the foliage to eat them. Turns out that when I ate more than a couple, the musky sort of undertones started to gross me out, so that was the end of that experiment for me. Lots of people love them, though, so I hope you are one of them. My grandma loves them, and whenever she comes over to our house she brings TONS of the little fruits to our house! I really like them, but only in moderation! They are super super sweet, and I can only eat a few at time. I guess I'm sort of like you, Kath, but luckily what I don't eat my grandma will! Just wondering... are there any purple ground cherries? Or anything interesting? The only strains i've seen are ground cherry... and Aunt Molly's Ground Cherry. I'm growing Aunt Molly's Ground Cherry. This seems to be the most common one, I don't even know of any others! Which ones did you grow, Kath? Or anyone, for that matter. My MIL has grown them "forever" and they just reseed all over her garden every year. She treats the ones she doesn't want like weeds and keeps the others. They always produce for her each year (zone 6b) that way, although later than if you start them early inside. She makes pies out of them and used to sell them to the local market as they are popular where she lives. She wasn't interested in any of my plants last year but when I decided I didn't want the fruits, she gladly took them and as a result has asked me to grow her some this year. The point being that there is a bit of a difference in taste in the varieties that are available. So last year I got seeds for "Pineapple Tomatillo", Aunt Mollie's Ground Cherry" and "Golden Berry Pineapple"- I think there was another one but I don't have any seed left of the fourth one. Looking at the seed packets, I do have enough to start some plants for her this year (and then she'll be set because of the reseeding factor) and still have some left over- I'd be happy to share them as far as they'll go. Just send me a PM if you're interested- I could get them in the mail tomorrow. I've always wanted to try the pineapple. 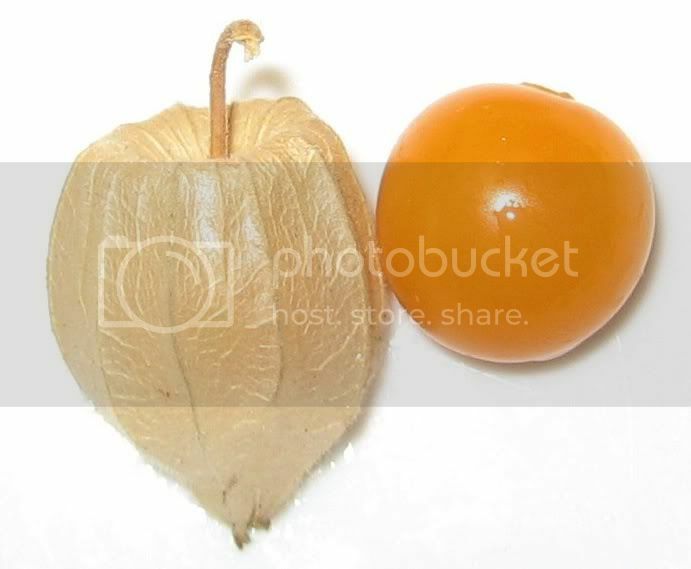 Physalis peruviana - Inca berry (aka Golden berry, cape gooseberry). Sturdy, shrub-like plants can get 4-5' tall and generally don't need staking. Husk-covered fruits are a beautiful, bright orange color and average 3.1 grams. The flavor is unique and intense - an excellent combination of tart and sweet. Some people absolutely love the flavor, others don't care for it much ("tastes like medicine", said one customer). For my taste buds and personality, it's one of the best fruits I've ever eaten. It's also touted as one of the best of the extra healthy "Super Fruits". Unfortunately, the fruits are very slow to ripen. I did not get my first ripe ones until late September and the fruits were just starting to come on well when frost hit a month later. This is even after an extra early start (Feb. 15th). The plants just won't hardly grow at all in cool weather. This is one plant that would benefit greatly from a high tunnel - both Spring and Fall - or from a greenhouse. Physalis pruinosa - Aunt Molly's Ground Cherry. Superlatives come to mind. For the tomato taste test I held in September, I threw in some of these, since so many customers had given positive feedback. This one scored perfect 10's for flavor across the board - something none of the 83 tomato varieties did. Very sweet, with a little tartness and not a hint of unpleasant flavors. I've seen kids who were gobbling up some excellent cherry tomatoes who, after trying Aunt Molly's, would reject all cherry tomatoes. Fruits are husk-covered, beige to light orange-colored, and (unfortunately) very small, averaging just 1.4 grams. I got an extra early (Feb. 15th) start on these also, but in this case the early start really paid off! The first ripe fruit fell off from a 4" tall plant on June 8th (beating out virtually everything else in the garden) and production continued at a gradually increasing rate until frost. At that point, the tallest plants were about 3' tall. I only grew 4 plants in 2011. Based on demand and customers' rave reviews, I will be planting at least 100 this year. Plus, I've decided to plant them in straight, narrow rows over cheap landscape fabric. Once the plants start putting on fruit, I'll staple down the fabric in the center of the rows and raise the edges about 8" off the ground, thus leaving a v-shaped catchment system for easy and essentially bug-free harvest. For, as with Inca Berries, these are really not worth eating until after they fall - without any coaxing - off the vine. Interestingly, germination rates are slow, sporadic and unpredictable for both varieties. This year I planted my first wave on Jan. 6th. My first Aunt Molly's were up in 9 days, 10 for Inca (8 and 7 last year, respectively). I'm still getting emergence from both varieties. Last year I had emergence continuing even 2 months after sowing. Taryn, I have high hope for the bales! It should definitely be interesting, for sure. I'm growing Aunt Molly's, so thanks for all of the info. guys! Thanks for the tempting offer, Kath, but I'm afraid I have got to say no to that because I already have so so so many seeds and so so so many plants on my grow list already! Maybe we'll make a trade this fall when I have some open spots next year. Thanks! Nice pics, Dale! 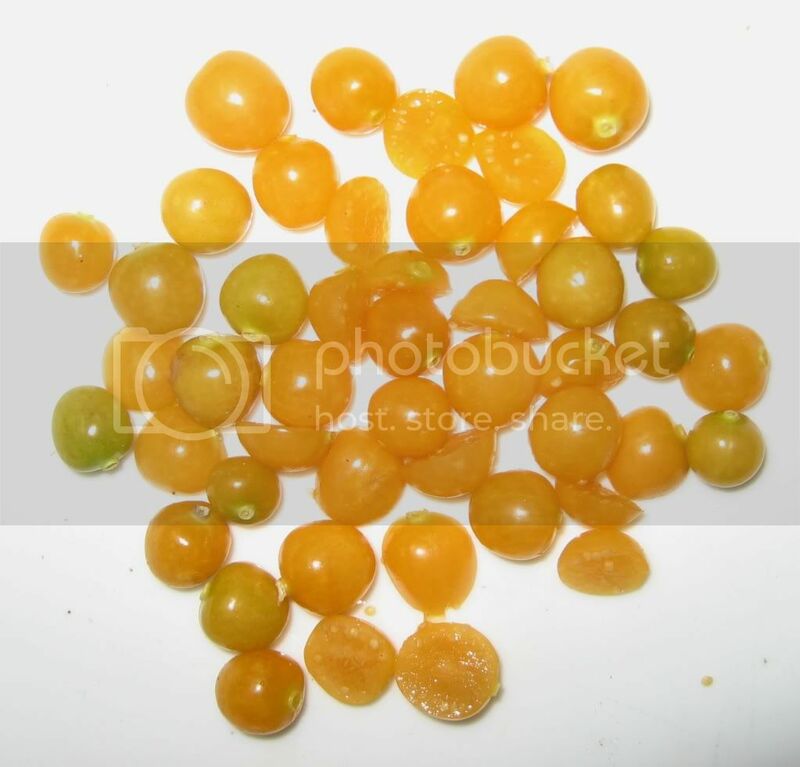 I've heard of those cape gooseberries before- what is the difference between them and ground cherries? cape gooseberries grow in a more profound bush shape or something? Anyways, the look good! And if they taste at all like a ground cherry, I can see why people would report a mediciney taste. They are really really really sweet! Thanks for chiming in, everyone. Fun to learn all these things and read everyone's posts! Wow, that is such a great idea! Looks fun. I might have to try that! I just got a packet of Copper Sunset nasturtium seeds, maybe I should tuck them as well as some marigolds into a bale like the website suggests... and maybe some herbs... oh! Zucchini! That'd be great! And maybe I'll throw in some of the dwarf project tomatoes! Oh no... I'm obsessed. I wanted to save some money on my new beds this year by getting straw bales for the filling. Then I went to price them. Almost $10 before tax, each! Last time I bought them, they were $1.50-2.00/ea. Wow! Cheaper to buy a yard of mushroom compost, so here I go again. Two yards at under $60. Ahhhh, that's better. Woohoo! My ground cherries germinated! It was interesting, one day there was nothing and the next day all the seeds germinated! With tomatoes, for me usually they sprout one at a time, but with the ground cherries it was all at once. Note that these guys did take longer to sprout, but had a better germination rate that my tomato seeds I'm growing right now. I'll post more updates as these guys grow. I'll probably keep two or three plants. Any other ground cherry growers, I encourage you to post pictures as your plants grow too! It'll be fun, we can grow them together. Just wondering... are there any purple ground cherries? Physalis is a rather large genus, with a whole lot of species that are all pretty similar to each other. The common tomatillo is the most frequently cultivated species. The little purple tomatilloes (Purple Mitla is a named variety) are, for all intents and purposes, a purple ground cherry (if you overlook the fact that the plant is more upright and less sprawly than most Physalis species,) and an unnamed purple tomatillo is the only Physalis I've ever grown successfully. As everybody says, they're very productive once they finally start cranking out fruit, but astonishingly slow to ripen. I suppose the old "put 'em in a paper bag with a banana" trick that works so well with other fruits would have helped here. I still have some very old seed of Kitazawa's "Giant Poha Berry," a Hawaiian variety ( http://www.kitazawaseed.com/seeds_poha_berry_2.html ) that was an easy germinator for me back when I bought the seed. Unfortunately, some of Albuquerque's giant cockroaches had taken up residence in the greenhouse that spring, and my tiny little seedlings made a great snack for them, none for me. Tomatoes and peppers, the cockroaches tended to munch just one seedling, and then realize they didn't like the taste. I suppose they must have some way of telling all their buddies about these things; one seedling per species, then no more. Unless they like it. Giant Poha Berry they like. If I can still get that GPB seed to germinate, I may try starting it in a different part of the house this year, and figure out some way to keep the giant cockroaches away. Poignant Aside #3872-A: I won't use poisons (except for mouse bait) because the spiders, and the competition from the giant cockroaches, keeps the little German cockroaches from ever getting out of hand, and those guys reproduce so quickly, they can go from a handful to a mighty nation within a few days, given the opportunity. Pesticides would give them that opportunity. I've lived in apartments that I fumigated to get rid of the German cockroaches, and within three or four of months, the survivors have been back, stronger than ever. Last summer, a 13-striped lizard (too fast to catch, too cute to kill if you did) found his way into the house and upset the balance of nature enough that the German cockroaches were just starting to get out of hand. But the lizard must have left at some point, and things have quieted down. Good. I love spiders. I don't bother them, they don't bother me. The giant cockroaches are too big for the spiders to eat, but they're a lot easier to tolerate than those nasty little German doobies. Cheap entertainment, too. Very satisfying to crrrr-unch them with a quick swat of the shoe when I catch them out in the open. Go to sleep, and the corpse is gone. Who hauled it away? The spiders, of course. I'll post pics of mine when they sprout, but I haven't started them yet. I'm growing giant cape gooseberry and Cossack Pineapple ground cherry.